It is 6:50 pm on an October evening. Fifty-five 11th and 12th-grade students pile into the Sharon High School (SHS) Library in quiet suburban Sharon, MA. As they crowd a plate of cookies and the coffee machine, their excitement builds. They are about to attend a college-level science seminar at their high school. This month’s Sharon STEM Talks speaker is Laura Laranjo, a doctoral candidate in the Biology Department at Brandeis University. By 7 pm, the students settle down, and for the next 45 minutes, Laura walks the students through the ins and outs of the drug discovery process from bench to bedside. After captivating the high school students with lessons about science, Laura leaves them with pamphlets for the Brandeis Research Experience for Undergraduates (REU) summer research program. Laura encourages the SHS seniors to apply for this paid summer research experience when they get to college. By 8 pm, the SHS library is empty again, and another monthly Sharon STEM Talk has successfully taken place. The Sharon STEM Talks high school outreach program is spearheaded by Vladimir Botchkarev, a postdoctoral research fellow at Dana-Farber Cancer Institute/Harvard Medical School. 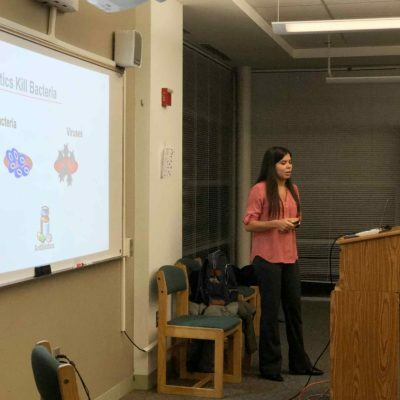 Vladimir, an SHS alum, wanted to give back to his town by establishing a science seminar series for current SHS students and community members. The mission of the Sharon STEM Talks is to stimulate scientific discussions within the community and to educate students about current topics in STEM. Vladimir’s efforts, in collaboration with his SHS colleagues, are supported by the American Society for Cell Biology (ASCB) COMPASS Outreach funding. 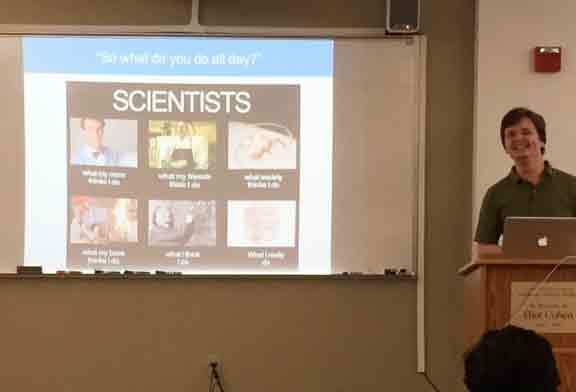 The Sharon STEM Talks have to date hosted 25 scientist speakers discussing topics in cell biology, genetics, medicine, astrophysics, marine biology, climate change, scientific publishing, data science, and science careers. The students love the Sharon STEM Talks—40 to 90 attend every month. SHS teachers encourage students’ parents and neighbors to volunteer as speakers, to cultivate the town’s scientific community. Several students were able to find summer internship opportunities through this outreach program. “Organizing the Sharon STEM Talks at my former high school is my favorite hobby. These students are eager to learn. Teaching them science is a very rewarding feeling. I’ve been fortunate to have had many inspirational mentors in my young scientific career. It’s important for us scientists to give back to the next generation of budding curious minds,” says Vladimir. The Sharon STEM Talks program is one of many excellent outreach events funded by the ASCB COMPASS Outreach Grant program. ASCB COMPASS offers opportunities three times per year to apply for outreach funding. We encourage all ASCB members to apply! The next deadlines are May 31, 2019, and August 16, 2019.